Cirio Rosa Jr. from Roma is holding his son Damian Rosa at Driscoll Children’s Hospital in Corpus Christi in an undated photo. RIO GRANDE CITY — Cirio Rosa Jr. of Roma was all smiles Friday at the annual Cattlemen’s Roundup held by Driscoll Children’s Hospital. The smile did not reflect the tragedy that struck a year earlier. The sponsored hospital benefit has become an annual tradition in the city as the funds raised are to assist parents like Rosa with transportation to and from their main hospital in Corpus Christi and the provided medical care. Rosa’s son, Damian, was born January 2016 at Starr County Memorial Hospital with complications to his spinal cord and with heart issues. When the complication were discovered, Damian was flown to Driscoll Children’s Hospital in Corpus Christi within two hours of his birth. 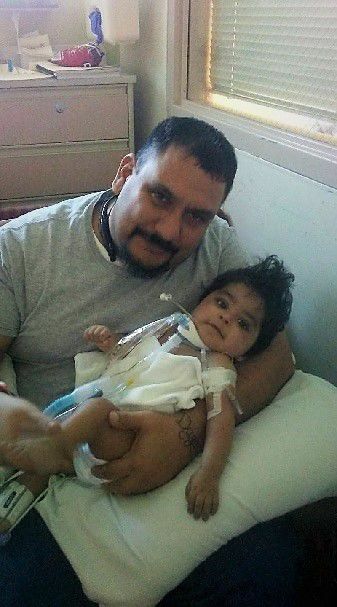 Baby Damian had spina bifida, a birth defect affecting the spinal cord. He was also stricken with a trachea problem that led to the hospital to insert a feeding tube into him before he was released to return home. The 37-year-old was at Driscoll in Corpus for approximately six to seven months, Damian was being treated. “I was sad, but the nurses they made me feel good – very comfortable,” he said about the time spent at the hospital. “It was like our home away from home. Rosa said, the nurses briefed him that Damian was ill and broke that news that the child had less than a year to live, more than likely just six months. “I was basically prepared, but I didn’t want for it to happen,” he said. Damian died February 2017, less than two months after his first birthday. Although Rosa has two other children, a 12-year-old and a 4-year-old, his affection and memory for Damian still lives on by the tattoos on his arms. “My Little Champion” is tattooed on his left arm along with Damian’s date of birth date of death. His name is written as a ribbon. Rosa’s right arm the heartbeat line with his son’s name Damian. “I was so attached to him every single day, by seven (in the morning) I was there with him until like 12 at night,” he said. Family tried to convince Rosa of leaving the hospital at times, but he wouldn’t Damian’s side. The Cattlemen’s Roundup, which has been a Rio Grande City staple for more than 20 years, is formed as an auction to fundraise for Driscoll Children’s Hospital by local 4-H clubs, Future Farmers of America chapters, county extension agents and local business. LaHuan Guthrie, development director, Rio Grande Valley Driscoll Children’s Hospital said the event is used for transporting children in their ambulance and make available any other medical services throughout each hospital. The fundraiser was held at the Starr County Fairgrounds and auctions items included agricultural equipment, jewelry, cakes, pies and other items. The proceeds will go toward the Neonatal Intensive Care Unit (NICU) Angel Eye Program at Driscoll. With this year’s nine cattlemen’s roundups, two more than 2017; Driscoll children’s hospital plans to raise more than $200,000, besting last year’s record of $195,000. To become a donor, visit www.driscollchildrens.org or call the hospital at (361) 694-6419 or the Texas A&M AgriLife Extension Service at (956) 487-2306. The next roundup is at the Edinburg Livestock Auction, 3418 N. Closner, Blvd on Aug. 11.